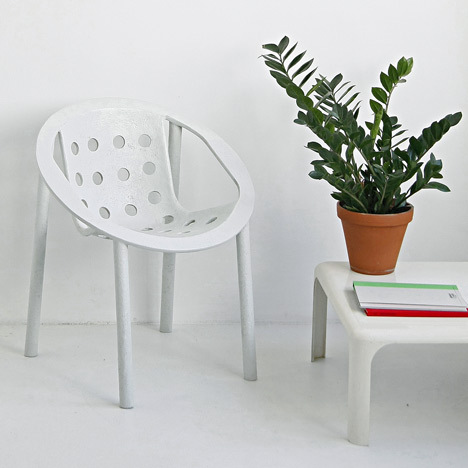 French designer Julien Renault presented this chair with a circular frame at Interieur 2010 in Kortrijk last week. Called Ring Fibre Chair, the prototype is moulded from natural fibres and comprises a seat shell suspended from the a ring, supported on four tubular legs. This prototype is the result of a year of work. The Ring Fiber Chair will be presented for the first time at the design competition of INTERIEUR 2010, Kortrijk. From an archetype to the ring chair, the first drawings attempt to bond the simplicity of a form and the legibility of elements which usually make up a chair. The principe is basic: a complex seat in natural fiber with a round simple frame and four legs organized around this merge. This construction based in periphery allows the stacking of 5 chairs. The chair is simple and logical. Her drawing is inspired by low curved wicker chair (for sitting room or garden), known by everyone. It’s an evolution of those classics (mostly anonymous) using new technologies in order to re-invent and perpetuate a typology already seen. The ring fiber chair is reduced by two main parts: a hull in a frame and four legs. The shape is similar to a fiberglass hull, such as the classic Eames chair. Here fiberglass is replaced by natural fiber (linen, coconut,...) forming by thermoforming or molding. It could be also achieved by injection of recycled plastic. These bio-composite hulls are light and resistant. These new processes are emerging in the automobile industry, the aeronautic industry and in our everyday objects.